The St. Columb's College panel pictured before their Markey Cup semi-final victory on Friday. St. Columb’s College booked their place in this week’s Markey Cup final thanks to an emphatic start and impressive finish which overcame Coláiste Na Carriage in a classic semi-final at the Melvin Centre, Strabane. The Derry school raced into an early seven point lead at 1-4 to no score with just eight minutes on the clock, All-star hurler, Eoghan Cassidy showcasing just how impressive a dual player he is with a fine individual major four minutes in. Carrick were never going to yield at this juncture and registered a goal with their first score of the contest nine minutes in as College goalkeeper, Matthew Stephenson spilled Dylan O’Gara’s pointed effort allowing Pauric Love to nip in and tap into the empty net. The Donegal representatives started the second period with a flurry, akin to that of their opponents in the first half, Ryan McShane rattling the net after just 33 seconds of play. Eoin Cormack registered a third major midway through the half to give his team the lead for the first time in the contest as it appeared that the City school had squandered their early dominance. Like all great sides do though, the Derry students stopped the rot and got back into the game with Fergal Mortimer keeping the scoreboard ticking over. Indeed, the Tir Chonaill men failed to register a score in the final 12 minutes as St. Columb’s stepped on the gas to register the last five scores of the game. Shea Browne levelled before kicking his side into the lead to set up a final pairing with another Donegal opponent, The Abbey V.S. There was merely three minutes on the clock when Mortimer registered the game’s first score from a free after referee Kieran Eannetta spotted an infringement on Shea Browne. The dominance of the Derry men was beginning to tell even at this early stage. Wing-back, Cassidy turning over the ball before soloing upwards of 60 yards to calmly slot the ball into the back of the net. Carrick deployed 14-men behind the ball, a reaction to their opponents’ lightening start, but this wall would be breached as Cormac Mooney split the posts after some patient build-up. From the next kick-out, Tiarnan O’Kane claimed a breaking ball to set up Shane McElhinney for a point as the razor sharp forward, Cahir McMonagle turned on a sixpence to add another. After just eight breathless minutes St. Columb’s led by seven at 1-4 to no score. The Donegal school did not let their heads drop though and registered a goal with their first score of the contest, O’Gara’s attempt dropping short before being fumbled by Matthew Stephenson which was enough to allow Pauric Love to fire the ball into the net. 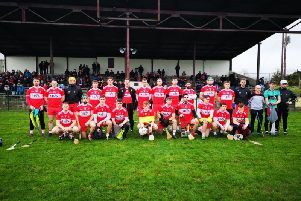 Tiarnan O’Kane replied for the College and it appeared that normal order had been resumed when Mortimer and Eoghan Cassidy added further scores to cancel out the goal. Eric Carr landed a score to inspire any side but James Lynch would claim a mark from the next restart before slipping the ball to Mortimer on the run and he didn’t need to be asked twice while pointing. Patience was the order of the day for both teams given the rigid defensive screen’s deployed when they surrendered possession. Paul O’Hare picking a delightful pass inside to allow Ronan Gillespie to point. Jason McAleer and Mortimer pointed before Gillespie landed a brace with the final two kicks of the half as the Oak Leaf men led by five at the interval on a 1-9 to 1-4 half-time score. Carrick emerged sharpest for the second half and landed a real statement of intent 30 seconds in, Ryan McShane finishing an intricate passing move into the bottom left corner of the net. Mortimer landed a free to settle his team as substitute, Jude Og Moore had a shot at goal cleared off the line by Thomas Byrne. Gillespie landed a free before Derry underage star, Mortimer, landed his fourth of the contest with a spectacular curling effort from range. 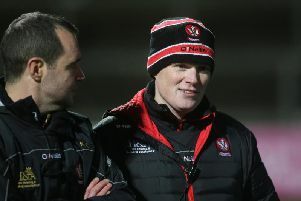 Eric Carr responded by nailing a ‘45’ before two minutes later, Paul O’Hare once again picked a pass in the tightest of areas to meet the run of Eoin Cormack who riffled the ball into the net. For the first time in the contest the Donegal men led as Gillespie extended his team’s lead to two with a fine long range effort. However, it would be prove his side’s last score. Jude Og Moore was fouled allowing Mortimer to cut the gap to one as Shea Browne showed real nerve from 40 yards to level the contest with 10 minutes to play. Browne kicked his side into the lead with eight to play before James Lynch swung over to put two between them as the game entered into injury time. It became clear that the men in red would need a goal to save their season and they almost had that only for the strong resolve of Naoise O’Mianian in the tackle to stop Love getting in for a sure goal. The St. Columb’s full back put the icing on the cake with the final action of the game, bombing up the field and finishing with the outside of his right boot to seal a spot in the final for this school. St. Columb’s College: Matthew Stephenson, Michael Lynch, Conor McLaughlin (0-1), Padraig Nelis, Tiarnan O’Kane (0-1), Shane McElhinney (0-1), Eoghan Cassidy (1-1), Cormac Mooney (0-1), Jason McAleer, Shea Browne (0-2), James Lynch (0-1), Ryan Brown, Cahir McMonagle (0-2), Caoimhin O’Connor, Fergal Mortimer (0-6 4f). Subs: Jude Og Moore for C Mooney (HT), Naoise O’Mianian for C O’Connor (HT), Jack McLaughlin for J McAleer (39). Coláiste Na Carriage: Colin Doherty, Thomas Byrne, Cormac O’Leirne, Aiden McGinley, Dylan Kelly, Dylan O’Gara, Ryan McShane (1-0), Ronan Gillespie (0-5 2f), Oisin Byrne, Eoin Cormack (1-0), Eric Carr (0-2 1f), Joseph Lyons, Paul O’Hare, Pauric Love (1-0), Seanie Boyle. Subs: Eoin Love for S Boyle (39).